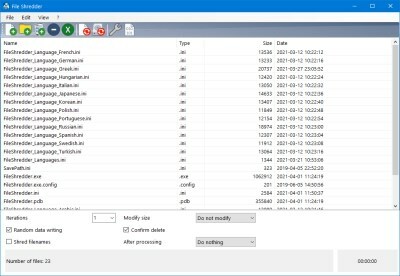 This program offers the possibility to finally delete files and/or folders (no recovery possible). The program also can overwrite the free space on a drive, which means, that already deleted files cannot be restored, too. The program offers also options to select how the overwriting shall be done (using a specific value, random values or a file-content as template). The program is freeware/open source. IMPORTANT NOTE: You are using this program at your own risk. Think carefully which files you want to delete!